RC: What's the story behind the little spoken word interludes where it sounds like a little kid talking about stuff. 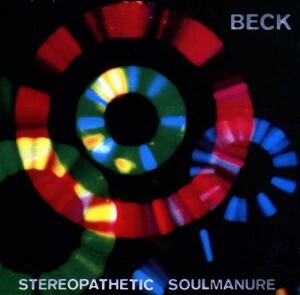 Beck: I had a microcassette recorder and I was fooling around one day and I started talking into it making up stories and then hit 'stop' by mistake and had to start again but it sounded great the way it just cut off, the way the kid was talking and then it had a high-speed mode and I sort of just discovered this character and I just started telling stories into it like it was a diary. So I started using it [during] my shows, I'd talk about this kid and I'd found this tape and this was his diary, and use little snippets between songs. A couple of them made it onto that record, I had a whole cassette full and I played it at a show in Seattle around that time and someone jumped up on stage after I'd left the stage and grabbed the tape recorder. All those stories are lost, but a couple of them survived on that record.